When we began researching an article for our annual publications Legends & Legacies this summer we began to realize that our organization has now been around long enough that we have members that grew up watching their mother’s involvement in the Junior League. 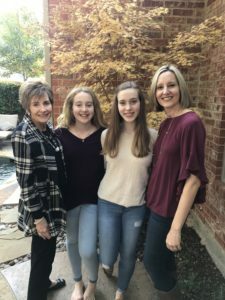 Angie Adams Sifferman is a Junior League of Collin County Past President, her mother Sue Adams is now a Sustaining Member, and Angie’s daughters Avery and Sloane may be future members. My mother never pushed me to join the Junior League. Despite all of her years of League work and sustaining membership, she respected that I needed to choose for myself. In fact, she was so reserved about it, I believe she was surprised when I joined. After working as a consultant for a few years in corporate America, I felt that I was missing something. I had opportunities to do meaningful volunteer work through work, but it wasn’t quite filling the gap. Looking back, joining the League was an easy choice. 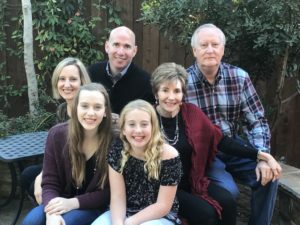 I considered briefly whether there was a particular cause or agency that tugged at me more than another, and quickly realized that it was more than simply volunteering that I was seeking. Junior League gave me the chance to go broad and deep at the same time. I could build broad knowledge about our community while spending focused time one placement at a time going deeper building particular skills and knowledge. I had grown up with the women and work of the League all around me, and I believe that that my exposure to the League impacted my views of voluntarism and community involvement without me even noticing. Joining the Junior League of Collin County is one of the most important decisions I have ever made. This decision forever changed my family’s relationship with our community. I thank my mother for introducing me to League membership by taking my hand and bringing me with her for the daily work. And I look forward to seeing what seeds have been planted in the hearts of my daughters. Thank you JLCC!